While freezing might feel rare here, the average overnight lows in January hover around 37°, and that is dangerously close to a frost. One night can make a big difference in the potential for damage in your pool equipment if you are not prepared. You might not need to bother with a full winterization such as colder areas of the country. There are even a few benefits to leaving your pool open as long as you maintain it properly. In addition to it keeping your backyard more beautiful, leaving your pool opened and caring for it correctly can help keep the motors running more efficiently and can also maintain the chemistry levels in the water. Should I Winterize My Pool in Texas? To some extent, yes, you should absolutely prepare your pool for winter even in Texas. You have a couple options as to what level of winterization you can go with. However, regardless of whether you drain the water or keep the pool open, prepping your valuable swimming feature for cooler temperatures and the possibility of overnight freezes is wise. Keep Pool Open in Winter? You’ll want to give some serious thought to whether you will actually get any use out of your pool if you’re newly in a home with a pool or had a new pool built recently. If you have a pool heater and it’s expected to be an unusually warm winter, you might be daring enough to consider using an outdoor pool on the warmer days, even during the offseason. If you entertain outdoors near your pool often, you also might want to have your pool remain running for the beauty of your backyard. As long as the rare overnight severe freeze does not sweep through the Dallas/Fort Worth area, and you have a freeze guard switch, you most often do not have to be concerned about pipes from your pool bursting. However, there are still steps of maintenance that need to be followed to protect the expensive investment that is a swimming pool. Winter, even in Texas, brings its own unique requirements for swimming feature maintenance or winterization. If you keep your pool open, it’s crucial to keep an eye on the water chemistry—there are calculators available to figure out your ideal pool chemical levels. Even if you almost never use your pool, it’s imperative to be sure the chemicals and PH are correct to avoid bacteria growth. A pool can be a pricey feature to install in a yard, and you don’t want algae or harmful amounts of germs taking over. Algae can grow even during near-freezing temperatures. In cold weather, it will create growth at a much slower rate. If the temperature drops below roughly 50°F the algae production becomes slow enough, you don’t usually need to worry too much about it. Shocking your pool with chlorine and then using a proper algaecide is a wise step if you plan to keep water in the pool all winter. Be sure to follow guidelines for what chemical and free chlorine (FC) levels are safe for swimming as well as safe for your type of pool. You will also want to make sure you keep a clean water line. The line where your water level sits can be a particularly fruitful area for bacteria growth. Keeping it clean with the right brush and chemicals is vital especially through winter months when pools get less use. It is also an area the first bits of ice will often occur if the temperature does drop below freezing (aside from the interior of pipes and the pump). Doing a quick brush or scrub around your water line will not only help keep algae and bacteria from building up, but it will also move the water around to prevent ice buildup at bay a little longer if a frost occurs. If you leave your swimming pool uncovered, you will probably need to keep up a brush and vacuum routine at least once a week. If you have lots of trees and therefore leaves in your yard, you’ll need to do this even more often. Keep an eye on your equipment. Regularly run the pumps and mechanics of your pool system to make sure they’re running correctly, and to keep them performing well. Leaving a motor of any kind left untouched and un-run for too long, especially in the cold, is a bad idea. Regularly running your pumps will keep any fluids and small-motor lubricants from sitting too long inside the pump, and it will more evenly disperse these when you run them. Even throughout the winter months, be sure to clean your filters weekly or bi-weekly. The dirtier your filter is, the harder your pool pump has to work. This makes it less efficient and also ends up costing you more in energy bills because it will need to run longer to circulate the water in your pool fully. Naturally, if you shelter your pool for the winter, or even for only during the coldest weeks of the season, you will have less debris to deal with. If you do not see yourself skimming your pool in the winter often, or don’t want to deal with vacuuming your pool in the winter all the time, we recommend covering it. You can consider a floating solar cover if you want to have the option of pulling your cover off relatively quickly. If you feel confident you will not get any use out of your pool until spring arrives, we recommend covering the pool for the season with a sturdy winter pool cover. A pool cover can prevent leaves from collecting or critters finding their way into your pool. The leaves and debris that can accumulate over the winter will only require more work for you once spring arrives. How Long Should you Run Pool Pumps in the Winter? Regularly running a pump is needed if you keep water in your pool. It will need to run for 6 to 10 hours at a time for proper water circulation. This, of course, will depend on both the size of your pool and level of cleanliness. You need to think about the amount of debris in your pool while running the pump. If debris such as excessive dirt, tiny leaves, or other outdoor waste is an issue, you need to run your pump longer. You can lessen the amount of time you need to run your pool pump, while also increasing its service life with proper care and use. Consistent cleaning and maintenance of your swimming pool will make your pump last longer. This includes using pool covers, automatic pool cleaners, and performing consistent cleaning with vacuums, brushes, and skimmers to remove dirt and lessen the load on your pool’s pump. If you retain the water in your pool, you will want to winterize your pool pump by having freeze guard or pool freeze switch installed. This guard or switch is a basic thermostat that will override your pool pump timer and turn it on if the air temperature drops too low. It is vital to set your freeze guard switch to fire up your equipment a few degrees higher than 32°F. You will want to do this because a freeze switch or guard will generally only be accurate to within a few (up to five) degrees of the actual outdoor temperature. We would recommend setting it for around 37° to be on the safe side. This feature can also save you money on electricity if you explicitly set your equipment to run at night rather than daytime during those winter months. This will help prevent any freezing during the cold nights and often will result in less run time than having your equipment running during the day. If you have a solar heater system, we highly recommend draining them if there is any potential whatsoever for even an overnight freeze. Solar heaters are exceptionally efficient heat absorbers. Conversely, solar pool heaters are also efficient heat drainers and can freeze rapidly. Freezing can cause your solar heaters to crack or be damaged beyond repair. If you can not empty your solar heater, at least keep it running during freezing temperatures to keep the water moving. Depending on the conditions and temperature, moving water will either not freeze or freeze much slower than stagnant water. This is the same reason having a freeze guard switch is an excellent idea. It doesn’t matter if you live in Grand Prairie, Dallas, Fort Worth, or Arlington, Texas (or any other DFW area cities). 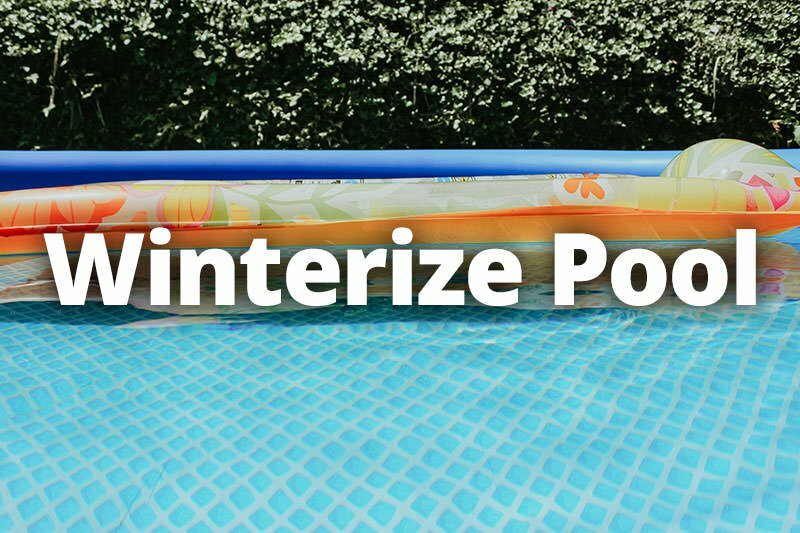 If you need help or have more detailed questions about winterizing your pool, we are here to help. Give us a call or use the contact form to get help today.